Over the last 12 years, the evolution of social media has influenced how organizations execute their marketing, recruiting and job candidate screening efforts. 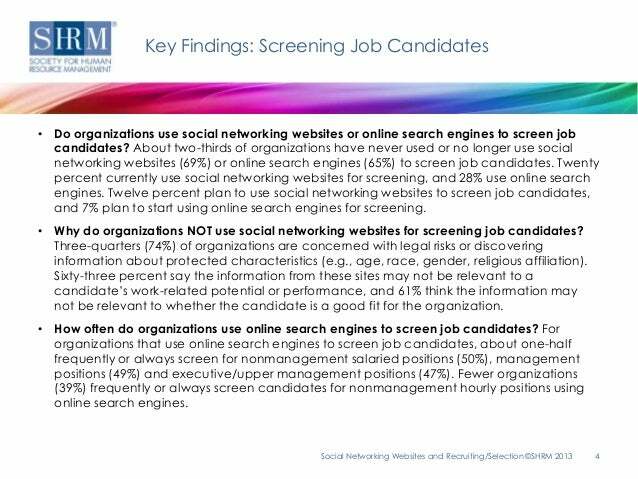 Many employers have turned towards using social media screenings in favor of more conventional practices during their hiring initiatives. They know that social networking sites are a fertile source for unfiltered and insightful information on candidates that is open to public view. As a result, employers often believe that they are free to use a candidate’s publicly available information during the hiring process without facing any legal repercussions. But, this can prove to be a grave misjudgment that can result in a litany of litigation problems. The survey also revealed that 21 percent of respondents admitted that “they’re looking for reasons not to hire the candidate” when mining social media sites for information on candidates. Yet even with this growing shift towards doing social media screenings, many employers do not realize that there are numerous precautions that they should be taking in order to comply with the requirements of both federal and state laws. Government agencies and nonprofits are taking extra measures to identify employers who may be covertly discriminating against candidates by gathering intelligence on them through less traditional methods. Employers need to recognize that certain types of candidate information acquired online may be subject to the law. Title VII protects these five personal characteristics as “protected classes.” Employers should assume all of the rules of Title VII apply when conducting social media screenings. Any employer who obtains candidate information on the Web, and uses it during their hiring process, has to adhere to Title VII and the protected class statutes. If an employer decides not to pursue, or hire, a candidate after discovering some protected class information about the candidate on social media, the employer puts themselves at risk for a discrimination claim. In such cases, the employer is in direct violation of Title VII and/or the other federal anti-discrimination laws addressing protected classes. Furthermore, employers who are considering going on social media to learn more about a candidate with a criminal history, should know that all the rules of Title VII and other federal anti-discrimination laws, cover such candidates. A candidate with a criminal record cannot be treated differently from another candidate with a similar criminal record based solely on a Title VII-protected characteristic. Employers can learn more about how to handle such situations by consulting the U.S. Equal Employment Opportunity Commission’s (EEOC) 2012 Enforcement Guidance on the Consideration of Arrest and Conviction Records in Employment Decisions. Employers who conduct social media background checks also need to comply with the Fair Credit Reporting Act (FCRA). The FCRA is a federal law that regulates background reports for employment. In many cases, the use of online data from social networking sites to screen candidates falls under the FCRA’s definition of background screening. Any HR professional can now access personal information that a candidate has either knowingly or unknowingly left on their own social media pages. As a result, employers are now able to obtain more detailed and damaging information about a candidate earlier in the hiring process. With the advent of social media, any employer can now glean certain types of candidate information prior to the interview stage. In some cases, it is information that the candidate never intended to disclose during the interview. Employers that use social media in this manner risk being investigated by the Federal Trade Commission (FTC), which enforces the FCRA. Any employer that conducts social media screenings as part of their in-house background checks, needs to realize that all the rules of the FCRA apply. When doing social media screenings, they need to follow the same FCRA compliance best practices that are recommended for traditional background checks. You must get written permission from your candidate prior to conducting any social media screening on them. The written permission must be in the form of a separate and independent document. Your candidate needs to sign and date any permission document that they agree to. Any of your candidates who voluntarily provide their information on social media accounts still need to provide a signed and dated permission document. If you discover unpleasant information about your candidate during the social media screening that compels you to stop pursuing them, you are required to disclose that information to your candidate. It is best to provide them with documentation of the information and the platform where it resides. The FCRA and protected class statutes within federal anti-discrimination laws are very significant variables that every employer must weigh when considering whether to incorporate social media searches into their background check processes. Social networking sites can offer an easily accessible wellspring of candidate information that is very tempting for employers to explore. But, employers need to have a strong understanding of the aforementioned federal laws before conducting social media screenings. Moreover, there are key state laws and recent federal rulings about employers’ use of social media for screening candidates. Every employer needs to consult with legal counsel and to be informed about these developments before looking up candidate information on social media sites. In Part II of this post, we will go into further detail about those states laws and a recent landmark ruling that impacts employers’ use of social media. We will also provide recommendations for how employers should approach creating a policy document for handling social media screenings.